Lake Phelps, the state's second largest natural lake, is a something of a geologic mystery. Formed on a vast peninsula lying between the Albemarle Sound and the Pamlico River, the lake is believed to be more than 38,000 years old. Scientists have long puzzled about its origin and have proposed many hypotheses, including underground springs, wind and wave action, meteor showers, peat burn and glacial activity. So far, no single explanation has gained universal acceptance. Sitting at one of the highest elevations in the area, Lake Phelps has an unusual ecology. The lake is shallow with an average depth of 4.5 feet and a maximum depth of 9 feet. Its waters are clear while most area streams and lakes are murky. Not fed by streams, the lake depends upon rainfall, making it one of the cleanest lakes in North Carolina. Five miles across, Lake Phelps harbors many species of animals that usually do not thrive in such an environment. In addition, the lake's unique water quality may be the reason for its remarkable capacity to preserve wood. From the mysterious origin of Lake Phelps to the present day, Pettigrew has a rich and fascinating history. This massive lake and the surrounding big-tree forests offer a more than 10,000-year glimpse into the relationship of human cultures and nature. Artifacts found in the area reveal the presence of Native Americans as early as 8,000 B.C. Archaeologists have uncovered thousands of relics, including intact pots and projectile points. The most fascinating discovery is a collection of dugout canoes--30 at last count--found sunken in the lake. One of them is about 4,400 years old. The Native Americans made dugout canoes by burning the interiors of cypress logs and scraping away the charred wood until only the shells remained. Archaeologists believe that the Algonquian Indians, who were seasonal campers in the area, sank their canoes in the lake's shallow water to store and protect them until the next hunting / fishing season. One of the canoes discovered in Lake Phelps is 36 feet in length, the longest known Native American dugout canoe in the southeastern United States. Another is the second oldest in the nation, radiocarbon dated to 2400 B.C.. Two canoes are on display in the park's information center. Before colonists discovered Lake Phelps in 1755, area residents called the swampy area the Great Eastern Dismal and the Great Alligator Dismal. The wilderness was so fearsome that explorers refused to enter its borders. Tradition maintains that a group of hunters ventured into this "haunt of beasts" to hunt and to look for farmland. Most of the men turned back, but just as the remaining few were about to leave, Benjamin Tarkington climbed a tree and saw the lake a short distance away. His companion, Josiah Phelps, ran into the water while Tarkington was still up in the tree. The first in the water, he claimed the right to name it Lake Phelps. Josiah Collins, who immigrated to the United States from England, developed the area surrounding Lake Phelps. He and his partners in the Lake Company drained the swamp, transforming the land into productive agricultural fields and prosperous plantations. In 1787, Collins established Somerset Place, named for his home county of Somersetshire in England. He brought slaves from Africa to dig a six-mile canal connecting Lake Phelps with the Scuppernong River. The canal served as both a transportation route and a channel for draining the swampland between the river and Lake Phelps. Later, Collins developed an extensive system of canals with locks to irrigate the area's corn and rice crops. The park is named for James Johnston Pettigrew, a Confederate general whose family home was located a mile east of Somerset off the old carriage road. The Civil War brought an end to the prosperity of Somerset Place. Unable to maintain it, the Collins family sold the plantation, which then passed through several owners until the Federal Farm Security Administration acquired it in 1937 for a New Deal Era Works Progress Administration project. In 1929, prior to the Federal Farm Security Administration acquisition of the Collins estate, the North Carolina General Assembly recognized Phelps Lake as a state trust resource, although at that time the state owned no land around the lake. In 1939 the commissioners of Dare, Hyde, Tyrrell, and Washington Counties petitioned the state for creation of a park in the area, based on the area's association with the Collins. Upon their purchase by the Federal Farm Security Administration, the Collins mansion and surrounding land were incorporated into the Scuppernong Farms Resettlement Project. The state gained control of the land in a 99-year lease with the U.S. Department of Agriculture in 1939, creating the state's sixth state park and beginning conservation efforts on the historic ante-bellum plantation site. In 1947 the federal government deeded the land permanently to the state and the park was permanently established. Additional lands were acquired in the 1960s and park facilities including boat ramps, picnic areas and campsites were added during the same decade. Additional lands were added to the park in the 1980s and 1990s. Today, Somerset Place is a state historic site occupying eight acres of land within Pettigrew State Park. The Division of Archives and History of the North Carolina Department of Natural and Cultural Resources administers the site. Next to Somerset Place is what was once the Pettigrew family farm, Bonarva. The Carolina Algonkians used the Scuppernong River for transportation through the dense swamp. Scuppernong is the Algonkian word for land of the bay trees. Scuppernong is also the name of a bronze grape originally known as the "big white grape". This variety of the muscadine grape was originally unique to this section of North Carolina and named for the river. Legends say that Sir Walter Raleigh sought out the grape and planted it on Roanoke Island for the colonists. In 2001, state legislators designated the scuppernong grape as North Carolina's State Fruit. The Scuppernong River was the main route for transporting logs, crops and other products to market and importing staples for everyday living during European settlement. Except for the town of Columbia and several landings, the river remained undeveloped. In 2002, The Nature Conservancy approached the North Carolina Division of Parks and Recreation about preserving the river, and in 2004 approximately 200 acres of Conservancy land was transferred to the state for creation of the Scuppernong River Preserve at Pettigrew State Park. North Carolina Division of Parks and Recreation. Pettigrew State Park. http://www.ncparks.gov/pettigrew-state-park (accessed December 12, 2015). 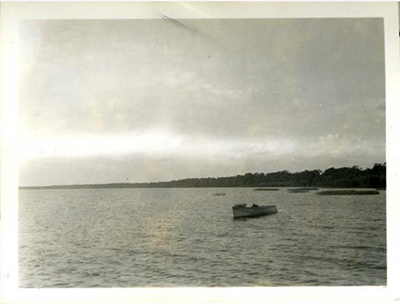 Resources on Pettigrew State Park, North Carolina Digital Collections, http://digital.ncdcr.gov/cdm/search/searchterm/pettigrew%20state%20park/...? (accessed December 12, 2015). Bailey, Audrey Kates, and William C. Friday. 2000. North Carolina coastal parks with host William Friday. Video. [Wilmington, N.C.]: Coastal Carolina Press. Pierce, Greg, and Edmond A. Boudreaux. 2010. A synthesis of the prehistoric archaeological investigations of Lake Phelps, Washington County, North Carolina. [Greenville, N.C.]: East Carolina University. http://hdl.handle.net/10342/2908.